The news report last week that Japanese telecom and internet conglomerate Softbank Group Corp is in talks to invest in FreeCharge was the third in as many months speaking of fund-raise efforts by ecommerce company Snapdeal for its digital payments arm. Around a month ago, two people in the know of developments at Jasper Infotech Pvt Ltd, Snapdeal's parent, had told VCCircle that Chinese internet giant Tencent was evaluating a proposal of around $150 million investment in Freecharge. In August, some media reports said that Snapdeal was in talks with Foxconn, the Taiwanese electronics contract manufacturer and also, an existing investor, to sell close to 26% stake in the digital payments platform it acquired in April 2015. The buzz that Snapdeal was out in the market trying to mobilise funds for Freecharge had, in fact, begun way back in October 2015 when The Economic Times - also the newspaper that reported the first instance cited above - said that Jasper Infotech was in discussion with existing as well as new investors to raise fresh funds for Freecharge. Snapdeal has not officially confirmed any of these reports. It even refused to comment on Techcircle's queries sent for the purpose of this report. There isn't anything out of ordinary in Snapdeal wanting to raise funds for Freecharge. In fact, recharge and payments companies have been at the forefront of fund-raising this year. In the midst of funding crunch that became a defining trend for 2016, recharge and payments stood out as a sector for having attracted big-ticket investments, and also, generating handsome returns for investors. Among the high profile deals accomplished this year were $60 million raised by the country's largest payments company Paytm from MediaTek, the Taiwanese semi-conductor manufacturer. According to media reports, Paytm is in the midst of raising another tranche of Rs 1600 crore ($240 million) -- a round that will take the total funds raised by Alibaba-backed company to over $1 billion. Likewise, of the total $120 million investment that the Sequoia-backed mobile wallet company MobiKwik raised since 2012, $90 million was raised only this year. The recent merger of South Africa's Nasper Group-owned digital payments company PayU Global with rival Citrus Pay was another big-ticket deal announced this year. The $130 million acquisition was one of the largest takeover deals in the rapidly growing fintech sector in India that gave blockbuster returns to Citrus' investors. Its early investor Sequoia, reportedly, exited the company pocketing 4x returns. Freecharge's own buy-out by Snapdeal last year made for an unprecedented deal in the consumer internet business in which the country's third largest ecommerce company Snapdeal acquired one of the top three consumer wallet firms FreeCharge in a $400 million stock and cash deal. Since then Snapdeal has been in news for wanting to raise anywhere between $150 million and $200 million for FreeCharge. 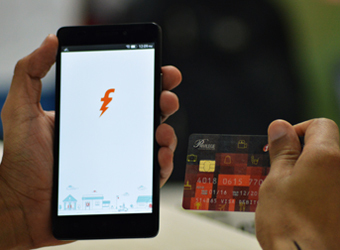 The ecommerce company is said to be seeking a valuation of over $1 billion for FreeCharge. There is no denying that Freecharge needs a fresh infusion of funds and that, too, urgently, say industry observers. Like ecommerce, digital payments companies, too, have paid little attention to unit economics so far and have primarily relied on heavy discounting to amass customers on their platforms. Speaking of Paytm, MobiKwik and FreeCharge, Sharat Jain, co-founder and CEO Online Recharge Services that runs a relatively smaller recharge platform Rechargeitnow.com, said: "â€¦whenever these firms raised funds, they spent it on cash-backs or discounts in order to acquire more customers." Heavy discounting has triggered a vicious cycle in which companies constantly need to keep burning, and consequently, raising cash. The rushed fund-raises by Paytm, MobiKwik and the Citrus Pay's acquisition by PayU Global reflect this bitter reality of the industry. FreeCharge had last raised $116 million in 2010 and last year, though it was acquired by Softbank-backed Snapdeal but the ecommerce company itself has been in doldrums ever since and is desperately trying to raise investments to sustain its own growth. Snapdeal, by its own admission, had acquired Freecharge in the hope that it will be able to marry its ecommerce platform with Freecharge's mobile and DTH recharge, and payment business and will become India's largest digital commerce company. At the time of announcing the buyout, Kunal Bahl, co-founder & CEO, Snapdeal, had said: "The age of monolithic ecommerce platforms is over; it is now time to build an impactful digital commerce ecosystem in India that is multidimensional and inclusive, delivering well defined experiences to consumers." Speaking of enlarged user base in the wake of the acquisition, he had said: "â€¦we have significantly enhanced our user base and now offer all our customers access to the widest selection of products and services online, making digital commerce an even more intrinsic part of their lives." Mobile recharge is the first digital transaction made by most customers in India. A blog on Snapdeal had, in 2015, noted that every day 75 million mobile recharges are done in India by a section of its 800 million mobile phone subscribers. Of these, only 3 million recharges are done online. This explains the huge untapped potential of the market. Snapdeal was hoping that with the mobile boom in India, not only the mobile recharge business will explode, it will also be able to seamlessly shepherd Freecharge's customers to its own ecommerce platform and induce them to spending more on its marketplace, and vice versa - as in the customers buying on its marketplace may be inspired to use FreeCharge's wallet and payment services. A large consolidated customer base and a spike in the number of transactions would have helped Snapdeal in pitching itself to investors as an ideal candidate for fresh investments, or so was it hoping. That, however, has not happened in the one-and-a-half years post the acquisition. Meanwhile, competition in the digital commerce space has become more intense. Since the time of its acquisition, FreeCharge claims that the number of registered users on its platform has gone up to 30 million, and that it hosts close 30 million monthly transactions. Of these, 20% are bill payments. In comparison, market leader Paytm claims to have over 122 million active users and that it hosts 90 million transactions a month on its platform. The other serious rival MobiKwik claims to have 35 million users and 45 million monthly transactions. 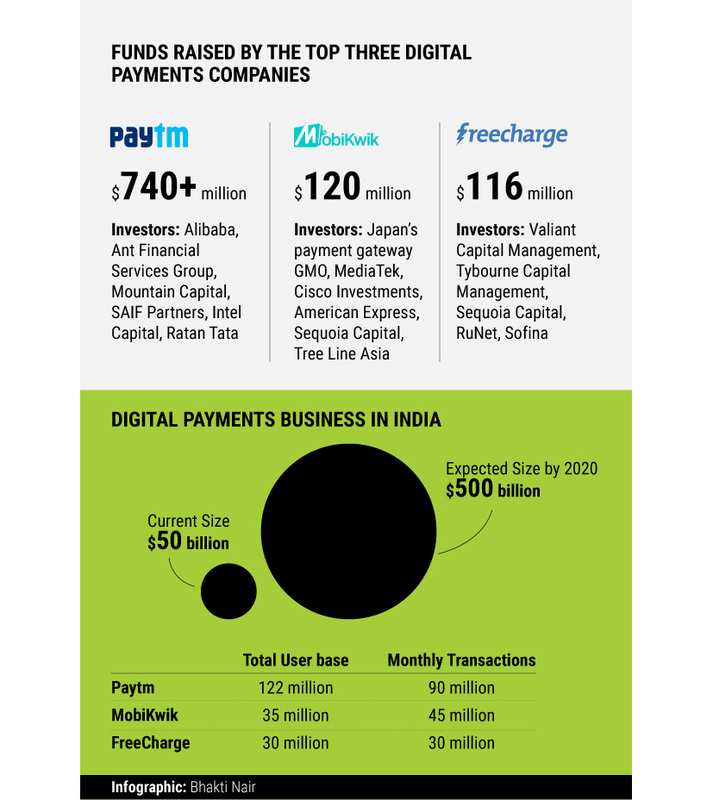 In addition to Paytm and MobiKwik, PayU Global, too, is emerging as a threat to FreeCharge. The merged entity, for instance, boasts 30 million customers on its platforms and has said that it is expecting to process 150 million transactions this year. Meanwhile, all these companies are making losses. Paytm, for instance, posted a net loss of Rs 1548 crore in the financial year ended March 2016 on a revenue of Rs 830 crore and there is no likelihood of the tide turning this year. Rohan Agrawal, senior consultant at market research firm RedSeer Consulting, said that India's digital payments segment has seen 600 million transactions in 2015-16 with the average transaction value rising to Rs 400-450 thanks to integration with e-tailers and increased willingness among customers to pay online for utilities and air tickets. According to a recent study by Google and the Boston Consulting Group, the size of the digital payments industry in India is projected to grow 10 times to $500 billion by 2020. The report predicts that more than 50% of India's Internet users are likely to use digital payments by 2020, and the top 100 million users are likely to drive 70% of digital payments by value. It is promising predictions like these that are keeping companies going. Snapdeal is well within its right to seek an investor for its recharge platform as it makes sense for it to want to monetize the investment it made in 2015. Frequent media reports saying that it is aggressively exploring a fund-raise, however, indicate that the company probably has not been able to find a suitable investor or the one that would agree to the valuation it is seeking.